Computer that plays sound (desktop, laptop or netbook). 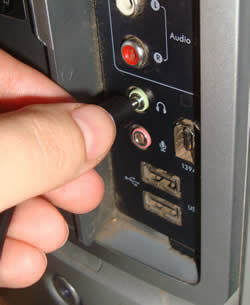 Use the headphone or output jack, usually colored green. Software that produces the desired resonant frequencies. Online or Download. Electrobooster to increase the energy of the audio output. Contact electrode pads, cords and plugs to connect everything. Once you have collected the above items, it takes about 5 minutes to build an Electrocleansing system. Take the black cord with the two mini plugs and plug one end into the audio output of your computer (speaker or headphone jack). The other end plugs into the Electrobooster Sound jack. Take the battery adapter and plug into a wall socket and into the Electrobooster 10-18vdc jack. Connect the two contact pads to the red pins on the flat white cable. Plug the other end of the cable into the Electrobooster Pads jack. Turn on the large intensity knob to low and the speaker volume on the Electrobooster. Make sure the computer volume is on low and not muted. Disable any computer pop-ups which produce sound. Go to Run Electrocleanse and highlight a disorder. Enter the amount of time for the session. Typical sessions are 20 to 60 minutes. Press the arrow key to start. Adjust the intensity on the Electobooster to a comfortable level. For additional umph, you may also increase the volume on your computer. The speaker volume on the Electrobooster is helpful for monitoring progress. The umph meter on the Electrobooster pulses with the frequency and shows the intensity. At the end of the session, turn off the two Electrobooster knobs before putting away the machine. Tip: To extend the life of the electrode pads, place a couple drops of water on the black rubberized side and rub it out to all the edges of the pad. This helps reactivate the polymers.